Creepy Witch finger cookies are a perfect Halloween treat. Because creepy is in on Halloween. How can something that tastes this good look so bad? It’s because the cookie is buttery shortbread. Butter has a lower than body melting temperature, therefore it melts in your mouth. 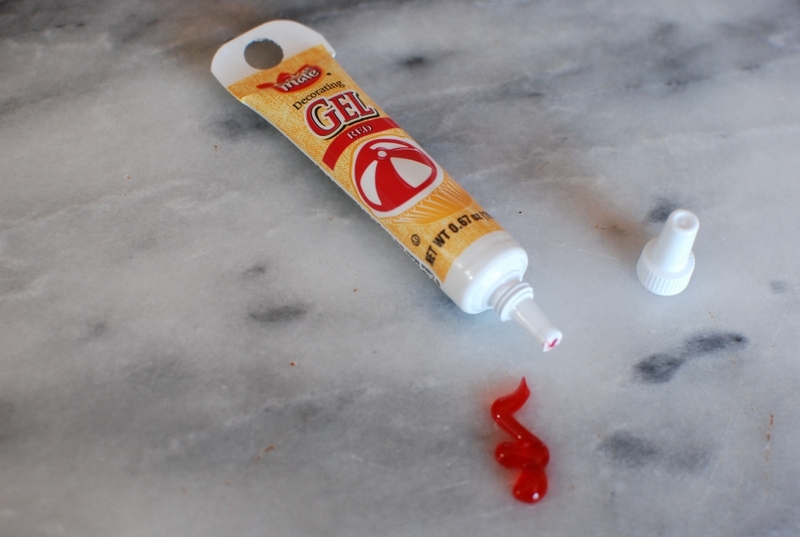 If you don’t want to buy red gel, use raspberry jam as a substitute. This is an extremely easy recipe. Not much to it at all. Gather and measure all the ingredients. 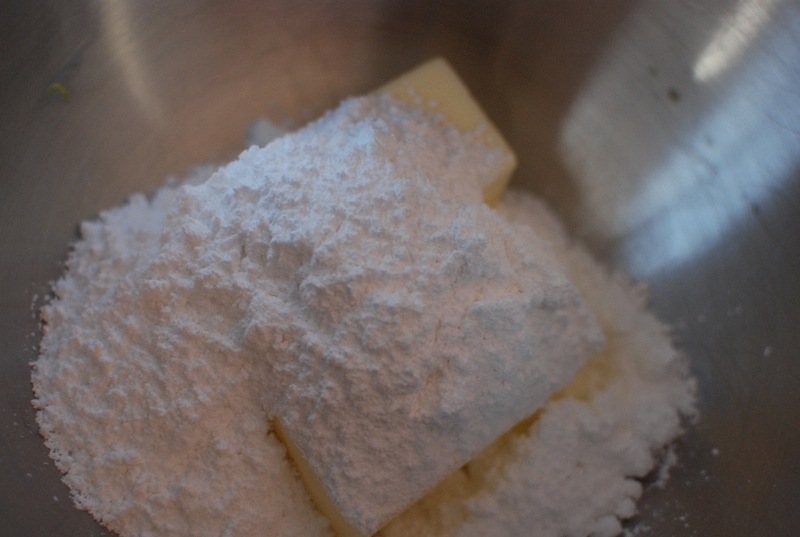 In a large mixing bowl, add the softened butter. Add powdered sugar. Mix until smooth and creamy. Scrape the sides of the bowl. Add the flour, salt, and baking powder. Note: If by chance you don’t have unsalted butter, lessen the amount of salt from 1 teaspoon to 1/2 teaspoon. 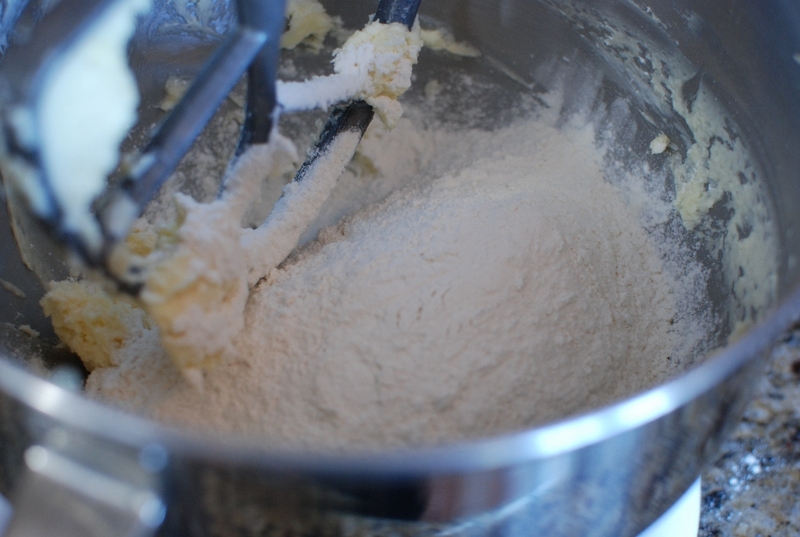 Mix until a stiff dough forms. Add a few drops of green food coloring until you get the green that you want. 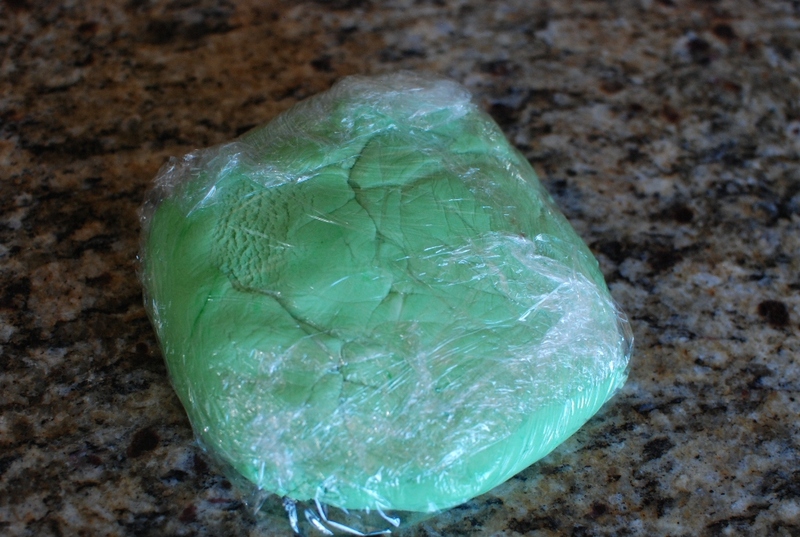 Place the cookie mixture onto a piece of plastic wrap. Wrap tightly and refrigerate for 30 minutes. 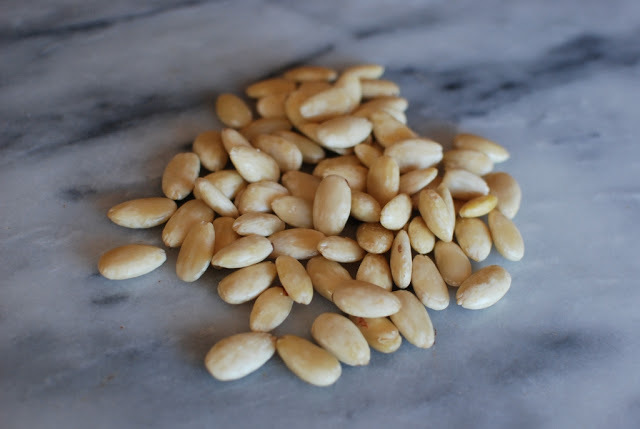 Make sure your blanched almonds are ready to go. Along with the decorating gel. You will need this after the cookies have baked. After 30 minutes, remove the dough from the refrigerator. 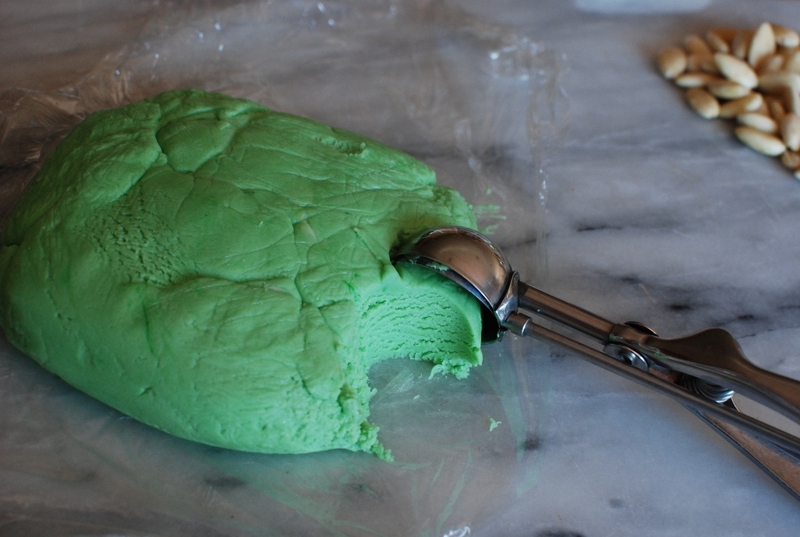 I’m using an ice cream scoop that is about 1 rounded tablespoon. Using a scoop will help keep the fingers uniform in size. 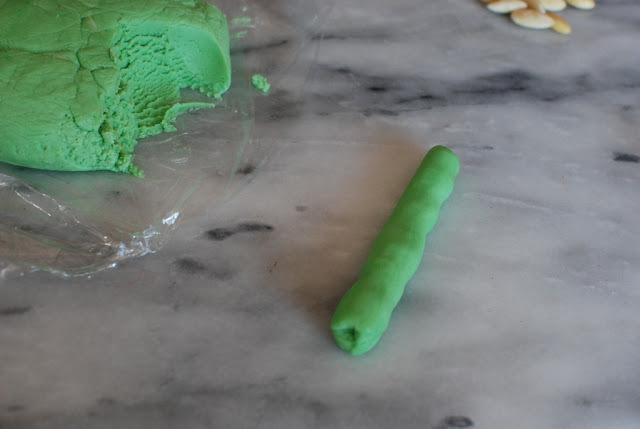 Scoop out a portion of dough.Roll the dough into the shape of a finger. Place a blanched almond on the tip of the finger and press it in slightly. 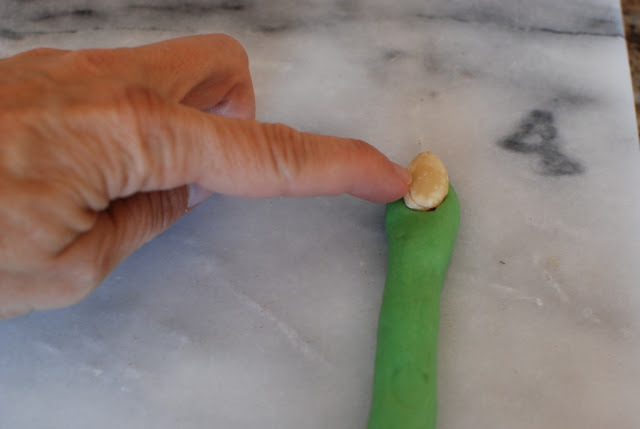 Shape the tip of the finger around the almond. Make an indentation where you think a knuckle would be on a witch. Using a toothpick or tip of a knife, make lines in the finger to recreate the wrinkles in my finger. Place the fingers on a cookie sheet. I always line my cookie sheets with parchment. Place in a preheated 325 degree oven and bake for 20-25 minutes or until beginning to lightly brown. As you can see the cookies spread out a bit. Let the cookies cool for about 3 minutes. Squeeze a bit of the red gel into the indentation. Press the almond back in place and the blood will ooze out around the fingernail. Gross! This is Halloween. Gross is in. Repeat on the remaining fingers. 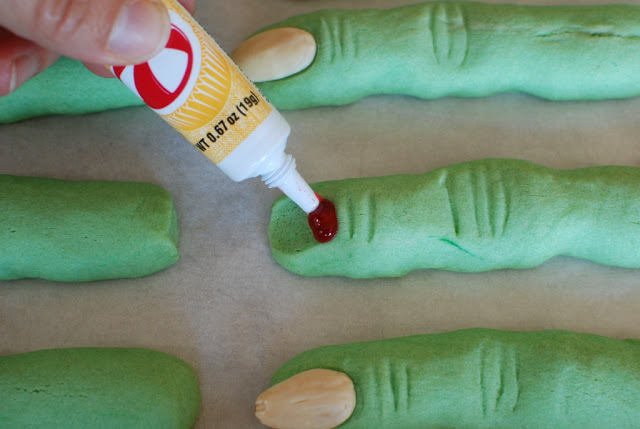 Chubby edible creep Witch finger cookies. If you have tried this recipe and like it, please rate the recipe below in the comment section after the recipe. I would greatly appreciate it. 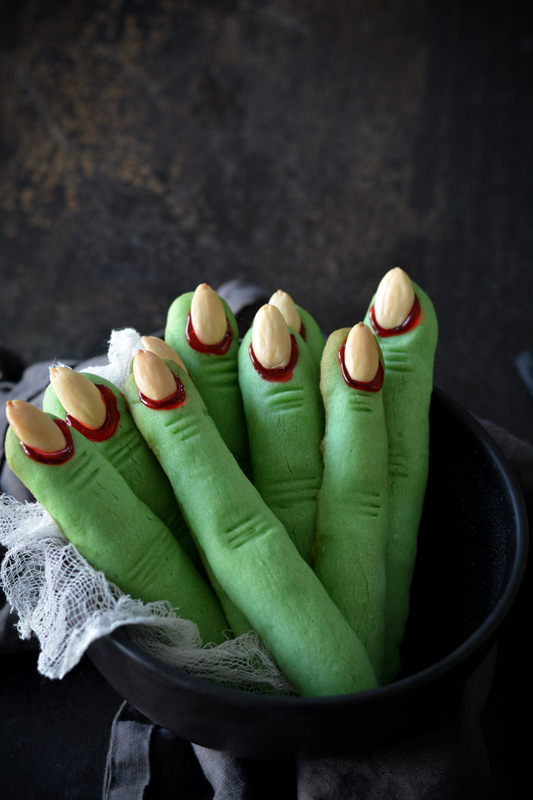 Tender crisp butter cookie shaped witch fingers. 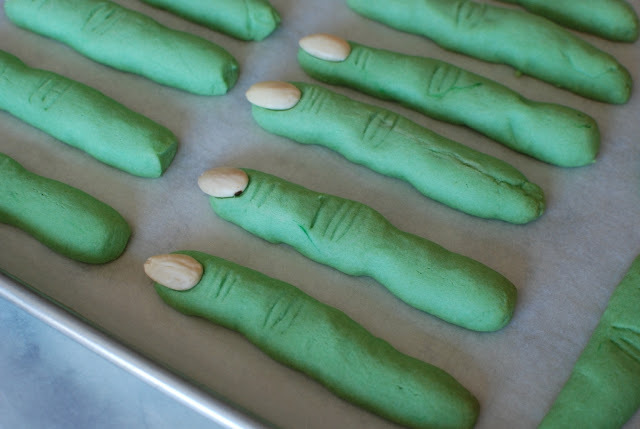 Creepy Witch finger cookies are a perfect Halloween treat. How can something that tastes this good look so bad? 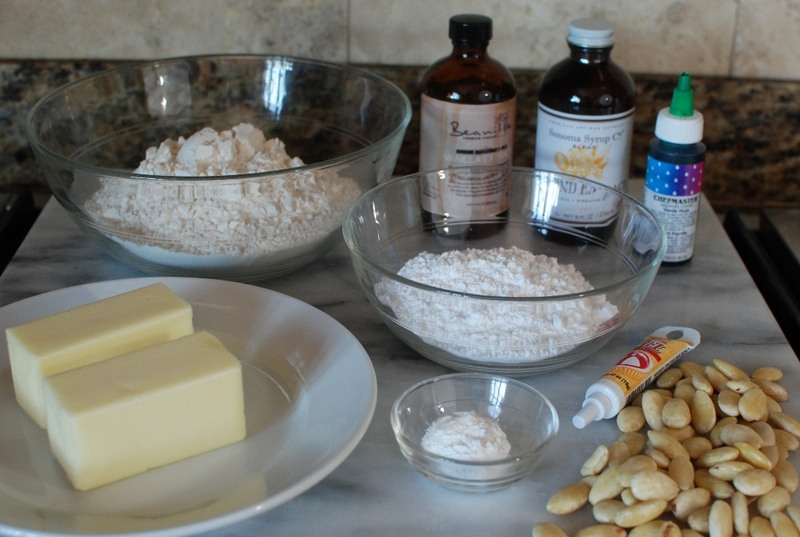 In a bowl, beat together butter, sugar, egg, almond and vanilla extract; beat in flour, baking powder and salt. 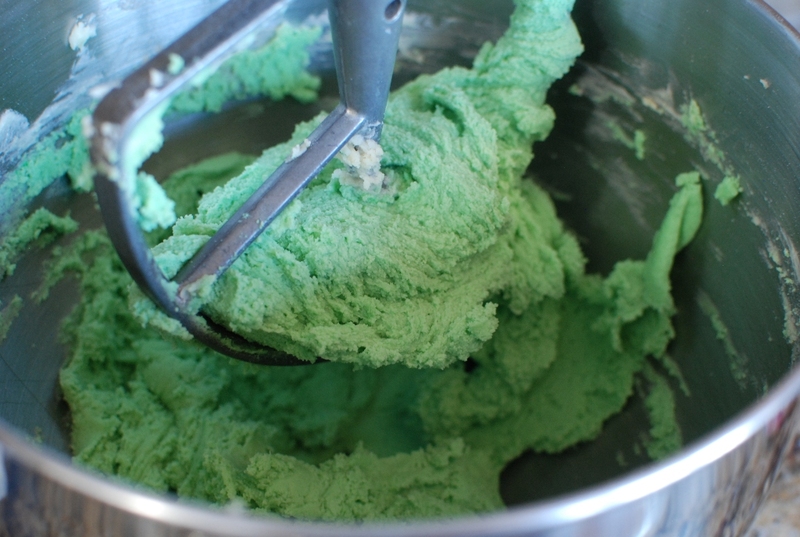 Add a few drops of green food coloring until it reaches your desired green. Cover and refrigerate for 30 minutes. Roll heaping tablespoons of dough into finger shape for each cookie. Press almond firmly into one end for the nail. 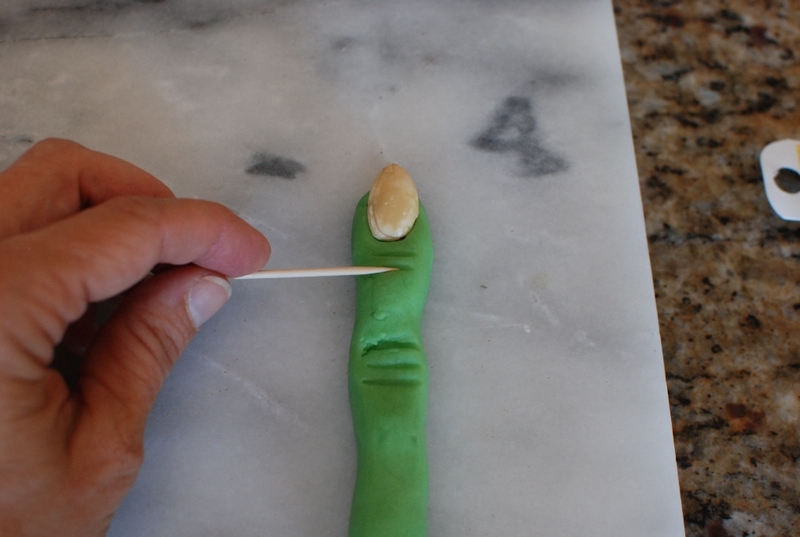 Squeeze in center to create knuckle shape; using a paring knife or toothpick, make several places to form knuckle. Place on lightly greased baking sheets or parchment lined baking sheets. Bake in a 325 degree oven for 20-25 minutes or until pale golden. Let cool for 3 minutes. Lift up almond; squeeze red decorator gel onto nail bed and press almond back into place, so gel oozes out from underneath. Let cool. Makes about 28 large cigar size cookies. If you only use 1 teaspoon of dough, you will get about 4 dozen cookies. 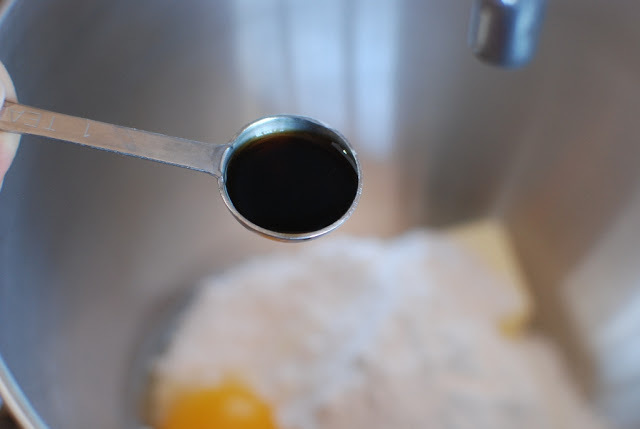 If you only use 1 teaspoon of dough, you will get about 4 dozen cookies. raspberry jam may be used in place of red icing gel. 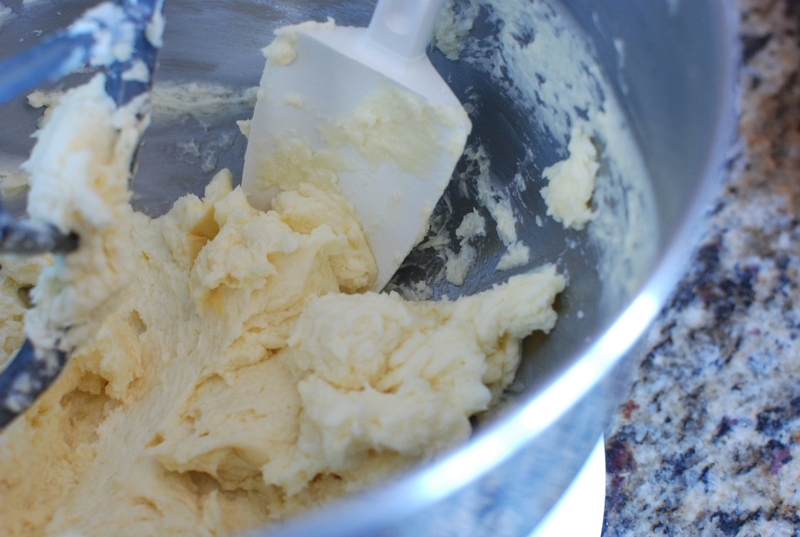 If using salted butter, decrease salt to 1/2 teaspoon. This is a fun and versatile recipe. I used slivered almonds, and painted some of them with red candy melts and pressed them into red sanding sugar, so they looked like fingers from glamorous witches. I served them with a chocolate/raspberry ganache dipping sauce. I saved half of the dough to make Christmas cookies this week. Thank you for a great recipe. Thank you for your kind comments and wonderful suggestions and ideas. I love the idea of a dipping sauce. You are so creative! Thank you for sharing your recipe. 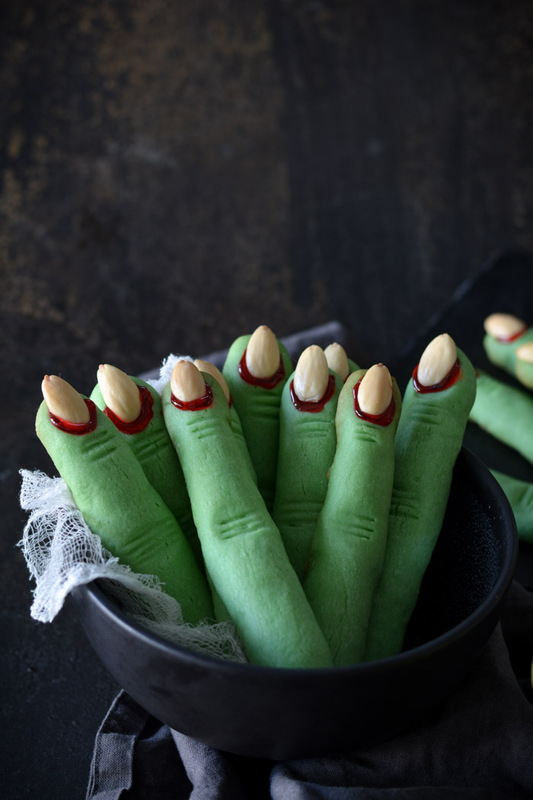 I made these at Halloween and they were a big hit and spooky enough that one of my nieces 4 yrs old said I’m not eating mo witches finger lol. I do have a question for you can You freeze these cookies after they are baked? I plan to make small cookies for THANKsgiving. So sorry to respond so late. I’m visiting my daughter in Singapore. Yes! The cookies freeze great. I froze a batch for 3 weeks and they were great! I have noticed how some kids won’t touch the cookies. So funny. Fingers came too wide. Really spread out. Didn’t look much like fingers. Dough was extremely hard to roll. TOO sift, Even AFTER PUTTING THEM In fridge. Dissapointed ! So sorry to hear about your witch fingers. I have never had problems rolling the dough. It should be quite pliable. The cookies do spread a bit, but never more than the photo. I’m sorry you have a bad experience with this recipe. It is so wonderfully gross. My 8 year old son just loves the bloody maggot looking raspberry jam dipped witch fingers. I will mention a Small thing… i didn’t see where the Recipe said to add food coloring so I was Ready To PLACE in the Fridge when I Realized They Weren’t green. I added it In after The dough was Formed and it worked But wasn’t IDEAL – there Was ALOT of elbow grease used! 🙂 Next time I’ll Make Sure To add food coloring before the flour. What a great recipe! I’m so sorry I neglected to put the food color in the recipe instructions. I have corrected that error. Thanks for bringing it to my attention. I just keep laughing over your raspberry jam/maggots. I love that idea. Try baking your cookies just a few minutes longer. It’s ok if they are starting to brown a bit. Thanks for sharing these great ideas! Love THE look of this receipe (especially the Green food coloring). 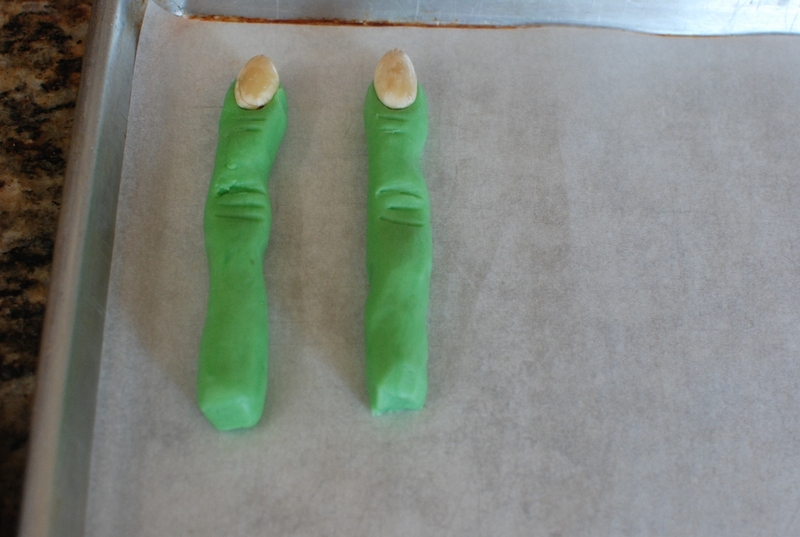 I have tried two others to make these witch fingers! Before I try this receipe, any advice on How to keep THEm from getting too hard and flat? Thank you so much for rating this recipe. It means so much to me. 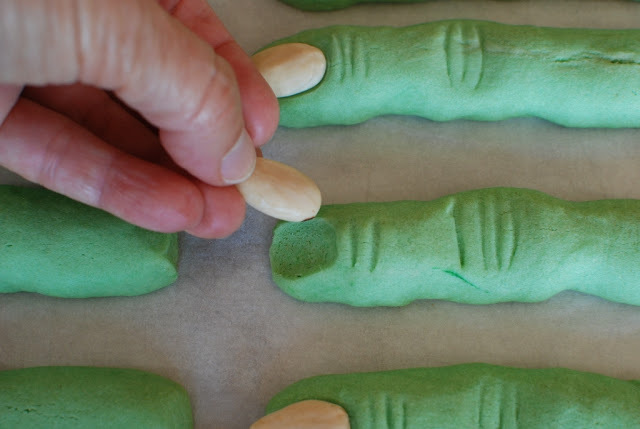 I would try to shape the cookie fingers with a higher rise on top of the cookie…like thinner finger but higher up. Does that make sense? Not totally round. Kind of oval, but with the height on top. The cookie shouldn’t be soft. It should be more like a shortbread cookie or biscuit with a tender bite. I hope this helps. Just made these and they came out perfect but I had to adjust one thing: I needed waaaay more flour than what’s in the recipe. So to everyone who has problems with the dough: just add flour until you can form the dough with your hands without it sticking to your palms. Make sure you use some extract (I added vanilla, almonds and some oranges to the other batch) to give them flavour. Refrigerate them for an hour before baking and work in batches so they don’ t get warm. My cookies held their shape completely, they haven’t gotten flat and they changed size only minimally. Thank you for taking the time to give such great advice. Can the cookie dough be left in the fridg overniGht? Yes you can leave the dough in the frig overnight. If the dough seems to hard to roll, just let sit at room temp for a bit until it is easy to handle. Happy Halloween. This is such an awesome idea!!!! I love it!! Thank you so much for sharing. I will try that when I make the cookies tomorrow. Brilliant! Raspberry jam is such a great idea with healthier benefits. I’m so glad they were a hit and yes, so creepy. Hi Kareina, I’m so sorry your fingers didn’t turn out. It’s hard for me to know what the problem could have been, so lets trouble shoot a couple of areas. Soften the butter only until soft enough to push a finger dent into it. Does that make sense? Don’t let the butter come to room temperature. Just soft enough to mix. Try adding 2 tablespoons more flour to help the dough hold it’s shape. You could, also, try refrigerating as long as an hour. I hope these tips help. I’ll feel so bad if your fingers flatten out again. Keep in touch. Thank u so much ! I might give them a try again today . I’ll keep the tips in mind , I melted the butter completely .. so that might have been one of the reasons . Any idea what might have went wrong ? ? I used raspberry jam instead of red gel and then add a little jam/shredded coconut to simulate nerve endings & blood at the base of the finger. They look so gross but taste so good! Ha ha now that's just gross. I'm sure kids love them. Thanks for sharing a great idea. Just made these with my grandson and they looked fine until we cooked them and they just spread into one big flat mass with almonds in. Don't know what we did wrong!!!! I'm so sorry you had problems. I have not experienced the fingers spreading out. Try refrigerating the dough next time??? 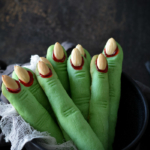 I have made this recipe a few times now over the years around Halloween and I love it. It's always a hit at the office. To make the fingers extra creepy looking I cut the finger with a knife at the other end to make it look like they were severed off the hand and then I brush on some of the red decorating gel on the end to make them look like bloody severed fingers. Happy Halloween! Ha ha what an awesome idea!! Yes they can be made in advance. I have put them in the freezer for a week. They are pretty much a shortbread cookie, which will keep in a container for several days. Can I use jam instead of deco gel? Absolutely. What a great idea. Love the step-by-step guide with the pictures and the laughs to go with it! Will be trying this soon. Thank you. Thank you so much. I hope you do try them. When baking the witch fingers, they fall flat. Why? Hmmmmm…did you refrigerate them for at least 30 min? You may need to add an additional 2 tbl. flour and refrigerate longer or overnight. I love them. Please allow me to add to my 2014 Halloween recipes ideas thanks! Absolutely! You have a great Halloween recipe collection. Great Pinterest site. I couldn't find almonds so I used pumpkin seeds. Worked out great. That's great. I like that idea even better. Thanks for sharing your great tip. 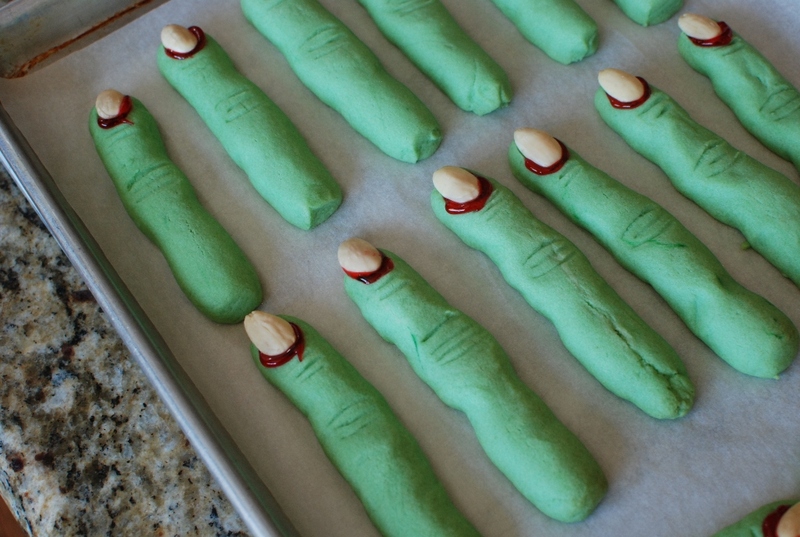 Just made these for my son's class for tomorrow…they are amazing! He loves how creepy they look. He even helped make them! Thanks for the recipe! Ha ha. That's so funny. You baked complete success. thanks for sharing your story I have smiled all day. I just want to say this is a great recipe and thanks so much for sharing. But please don't say such bad things about yourself. Your hands may appear aged, as have mine, but your hands, and nails, look just lovely to me! Very well maintained, NOT another witch hand at all!! would this work with the tubes of cookie dough? 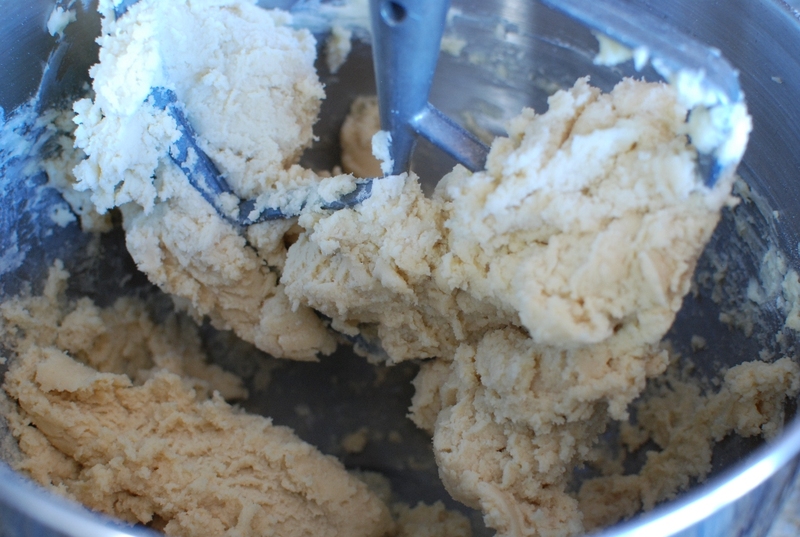 Yes, you can use with pre-made cookie dough, just add one cup flour to the dough. If it gets too hard, add a couple of drops of water and work it in really well! could you put the almonds in food coloring to have colored fingernails. I'm not sure. I have never tried that. Why not? i;ve GOT to do this with my grandkids…. i didn't have this recipe when MY girls were little. These are Great! I can't wait to make them for my grandkids. Thank you!!! Aren't grandkids the best? Thanks for your kind comment. They look amazing, will try to do them tomorrow. Greetings! So much fun for Halloween. Thanks for commenting. Very creepy! 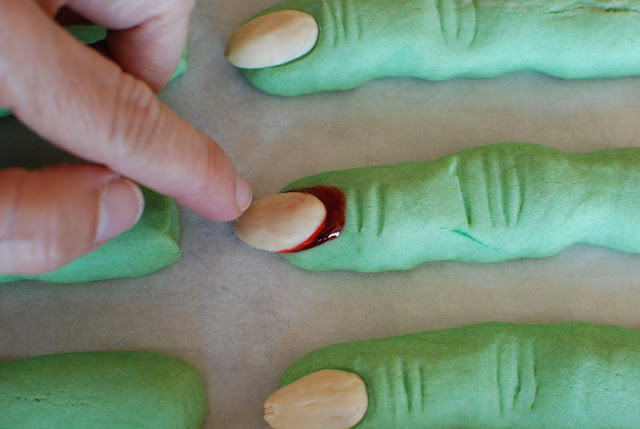 I am going to link to these in my upcoming Halloween Recipes post! So fun. Thank you. The are pretty gross, aren't they? Thanks Cristina. You made me laugh out loud. I'll be more careful about bashing myself. 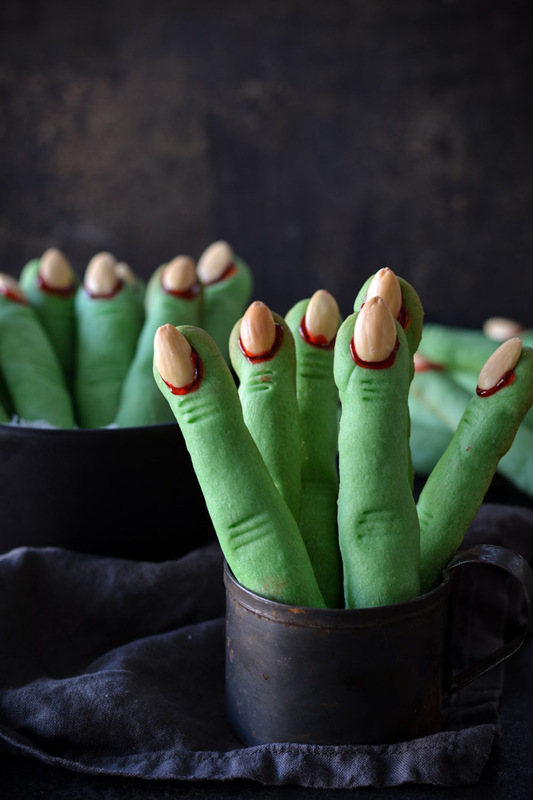 I really think you can make these witch fingers with chocolate. I think you'd be fine adding a few tablespoons of cocoa powder. Let me know how they work out. This is super impressive. A couple of questions please, can we make a chocolate form of this? should I add cocoa powder? if yes, what quantities? or should I just shower the dough with chocolate chips? Is the texture of this thing crispy wafer like or soft cookie like? Lastly, please do not badmouth your hands. We're your fans, we love what those hands can do. And the only reason you can conjure up such wonderful recipes to share is because those hands are willing to experiment instead of sitting pretty being pictured for some glossy magazine and struggling to not clutch at that next batch of fresh cookies. These ARE easy, because they don't have to look good. That's helpful for me. These are so fun.. seeing them everywhere right now… You make it look surprisingly easier than expected. Thanks for sharing! This looks really creepy..Should try it some day…Thanks for the recipe dear. 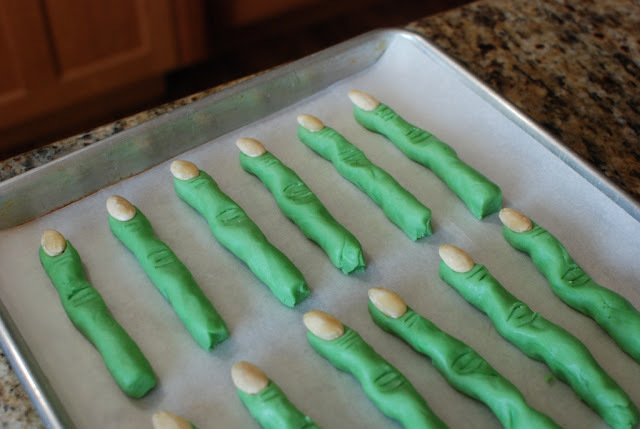 Thank you for the link back to my blog for the witch finger cookies, but the photo that you have on your site is not my photo.